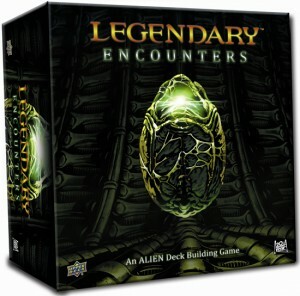 This game will appeal to players who like the Aliens theme, deck building games, and cooperative games. As you play, the suspense builds and tension mounts until you finally – if you survive long enough – meet the boss alien. Player interaction is encouraged and essential – special “coordinate” cards played from your hand on another players turn boosts their ability to attack or recruit cards. The game comes with 600 cards and a nice, visually appealing and well-organized play mat. With the cards sleeved, the box is only about half full so I anticipate future expansions (and that makes me happy). The art is very nice comic-style images depicting familiar faces and elements of the movies. The text readability on the cards is much better than in the “Marvel Legendary” game. Included in the box are divider cards to use after you’ve sorted the cards – I found that after I labeled the dividers the setup goes fairly quick (say 10 minutes). Each time the game is played, the scenario defines which cards will be used. There are three objectives, each with a corresponding deck of cards. These are placed in a semi-random Hive deck so that Objective 1 cards come up first, followed by Objective 2 cards and then Objective 3 cards. Alien monsters are added to the deck depending on the number of players so that the game scales up in challenge with more people. On the other side, the players select a role that grants a special ability (card); otherwise each player starts with the same basic set of cards in their deck. A Barracks deck is created from four different character decks, which are defined by the scenario: if you are playing the first movie, the characters are those in the first movie, etc. There are enough objectives and characters that when you play through the four movie scenarios you will not have any repeated objectives or characters. Each turn a new card form the alien hive is placed facedown in the Complex (the ship you are on) part of the play area. These aliens are hidden until someone scans the room they are in, at which point they become revealed. New hive cards “push” previously played hive cards, until eventually they drop from the Complex to a Combat Area and are automatically revealed. Aliens in the complex usually don’t harm the players; once they are in the Combat Area the aliens can strike the players, which degrades a players’ health. After the Hive phase, players have their chance to play their cards to recruit new cards, scan a hidden card in the Complex (thus revealing it), and/or attack an alien. Players can assist each other by playing “coordinate” cards which allow the active player to use that card as if it were their own. This is key to building up enough attack strength to take out the more difficult aliens. After the player’s turn, the aliens strike, then the round is over and the players draw back to a full hand (typically 6 cards). Throughout the game, there will always be a location and an objective card in play. The objectives relate to cards that will be played during the Hive phase; you are typically waiting for a certain card to be revealed and then you have to take special actions to fulfill the objectives. Once an objective is completed the next objective card (there are three total) comes into play. One of the interesting objectives is to find Bishop’s head and set it up in the complex where it can help to scan incoming cards from the Hive! The game continues until either all the players are dead or the third objective is completed. When we played the 2rd movie scenario, we went from 5 players to 2 survivors by the end; in the other scenarios I’ve played the players have survived. As if the game isn’t hard enough with the basic rules outlined here, the advanced rules establish that some players have hidden agendas (like in the 2nd movie! ), so you all might not be working together after all. I think this game is a ton of fun. I love the theme and the cooperative play. The ability to coordinate really encourages you to play as a team. The mechanics of the game are not very difficult, and really work to build up the suspense and challenge as the scenario progresses. I prefer this game over Marvel Legendary because the theme really makes sense and fits the game mechanics well – Marvel Legendary sort of feels random to me and there’s really not much story line in play. I’m looking forward to many more plays and the inevitable expansions!